How do start-ups and SMEs get their message out there? James Simmons, Marketing Manager at Mail Boxes Etc. UK, advises getting creative with print. There’s nothing like a bit of good, old-fashioned print to help SMEs promote themselves. Yes, so much of our life seems to be conducted online these days. But have a look at what’s on your desk or the notice board in your kitchen… print is still a thing, and for small businesses it’s a really cost-effective way of getting out there. Take the humble A5 flyer, for example. 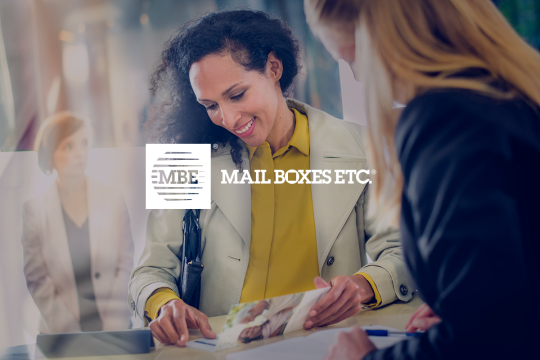 So much more than a ‘leaflet’ – although it can certainly be used as part of a cleverly targeted direct mail campaign or even a wider door-drop or local newspaper insert. The fact is, flyers work. They may be considered a bit old school these days, but if a flyer is relevant, eye-catching, colourful and contains useful information, there’s a strong chance that people will hold onto it. Whereas an online promotion may have immediate impact, as soon as you switch off your device it’s gone. But a flyer stays put. And because it’s compact and easy to pin onto a notice board or pop under a paperweight, it has longevity. With that in mind, let me encourage you to envisage more creative uses for the flyer. Create a sample menu or promote your seasonal dishes and latest cocktails. Create a mini menu that slips into each carry-out bag for your takeaway business. If your pub regularly has music, why not list upcoming events on a flyer that people can take home with them? Print a short customer satisfaction survey onto an A5 leaflet and get customers to drop it back for the chance to win a free meal. Folded to A6, a flyer can make the perfect appointment card for hairdressers, beauticians or massage therapists. Or a price list leave-behind. Churches, clubs and charities can use flyers to advertise their events, for orders of service or as mini-posters for parish notices. 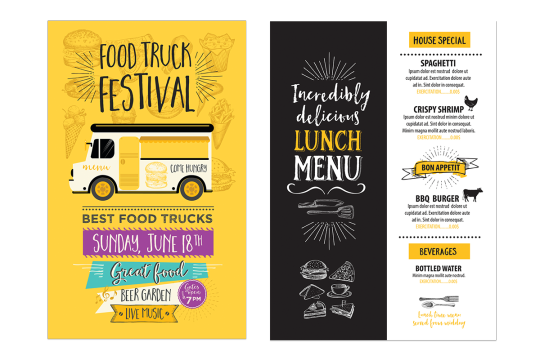 Creative use of space will enable a flyer to take on the role of corporate brochure too – great for consultants, trainers, dog-sitters, decorators or dentists. There’s also scope for packing a newsletter into the compact format of a flyer – cheap to produce, easy to mail out, and you’ll be forced to keep it brief. Flyers can be upmarket, minimalist, creative. Shocking, simple, retro or modern. Crowded or sparse. You can use text and graphics or stunning photography. Load up with information or leave ‘em wanting more. Why not take advantage of our offer? If I’ve whetted your appetite for the mini power-house that is the simple leaflet or flyer, you may be interested to know that Mail Boxes Etc. currently has a two-for-one promotion if you order 1,000 or more (ends 30 June 2017). And you may also want to think again about the postcard. And, dare I say it, the business card. But more about those next time.